Project Freelance 2017. I have less than 10 days left to meet my goal. This is my first foray with crowdfunding and I appreciate all the exposure and contributions possible. Please share the campaign with your social circles and consider donating. EVERY contribution has an impact. EVERY contributor receives audio recordings of ALL seminars. Seminar topics include: 3 Queries That Worked, Business of Being a Writer, Future of An Article (How to Re-print, Syndicate, Adapt to Book & More), Liabilities of Journalists, Query Letter Mistakes to Avoid, Writing Income Beyond Journalism, Contract Terms to Avoid, How to Find Editor Contact Information, Trade Magazines v. Consumer Magazines, Writing the Query Hook, What to Do With a Rejected Query, and 3 More Magazine Queries That Worked. I will hold as many events as the campaign allows. As of this writing, the campaign will cover 5 months of free seminars for communities and schools – help make it a full year! Thursday, July 13th is First Lines: Sharpen the Hook in Pittsboro. Don’t lose your reader from the start. Let’s look at what makes a hook. We will explore examples in fiction, memoir, and poetry. Bring your first pages for collaborative review and suggestions. A short time will be dedicated to producing new hooks that may inspire completely new stories or poems. A delicious dinner is included. Vegetarian and gluten-free options available. Seating limited to keep our discussions productive and personalized. Chris Abbate’s debut book of poetry, Talk About God, is forthcoming this fall from Main Street Rag. Sue Barnett instructs BASIC GRAMMAR AND WRITING ENHANCEMENT ($85) Sept 10 – 24 Tues evenings 6:30 – 8:30pm, Millbrook High School (or Sept 12 -26 Thursday evenings 6:30 – 8:30pm, Sanderson High School). She also instructs BASIC FICTION WRITING ($145) Sept 18 – Oct 6 Monday evenings 6:30 – 8:30pm, Sanderson High School. Register through Wake Tech. A poster of Glenn Cassidy’s poem “In Men We Trust” was on display in the gallery at the WUIS studios through the months of May and June as part of radio station’s exhibition on the first 100 days of the Trump Administration. “Links in a Chain of Missteps,” a short nonfiction story by Cary, NC writer Denis DuBay, was selected as one of five finalists for the 2017 Alex Albright Creative Nonfiction Prize. Courtney Girton has a short story in a forthcoming anthology. The Triangle Chapter of Sisters in Crime will host a Book Launch event for Carolina Crimes: 21 Tales of Need, Greed, and Dirty Deeds at McIntyre’s Books from 11:00am-1:00pm on August 19, 2017. Tara Lynne Groth (me!) 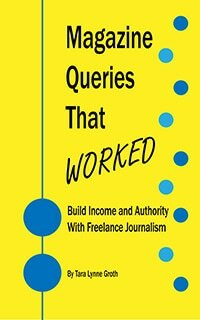 published Magazine Queries That Worked: Build Income and Authority With Freelance Journalism. It’s a collection of all her successful query letters, the stories behind each article, how much she was paid, when she was paid, and how her workflow as a journalist changed as a result of each article. Artist Barbara Hengstenberg is excited to introduce her new blog, Creativity Jolts, which she hosts through WildesArt. Writers, artists…all creatives!…are invited to contribute blog posts and creative ideas to WildesArt at gmail dot com. In return, if your post is selected, Barbara and WildesArt will promote your piece and your works on social media. Join the conversation! Join fellow Triangle Writer Matt King‘s newsletter, and fill the superhero fiction void that makes you weep randomly in public places. Matt serves up news on his own comics-inspired fiction universe, as well as supplying you with enough free short stories to keep the sadness at bay. Subscribe before mid-July to get exclusive news on his forthcoming book, GODSEND. Brian Lang continues his writing challenge for 2017: to publish a novella every month. The first three novellas are now available in both paperback and Kindle format as The Knight’s Journal I. The fourth and fifth novellas were published in late April and late May, respectively. These entries are collectively known as the Knight’s Journal series and document the tasks being completed by Aidan Garethson, the son of a knight, as he seeks to become a knight himself in post-Roman occupation Britain. Jennifer Riley‘s short story “Rolla” will be published in the 2017 Triangle Sisters in Crime Anthology Carolina Crimes: 21 Tales of Need, Greed, and Dirty Deeds. Nora Gaskin Esthimer edited the anthology. New York Times and international best seller Jeffrey Deaver, who lives in North Carolina, wrote the introduction. Jennifer serves as part of the marketing team. A book launch is scheduled for McIntyre’s Books, Fearrington, Saturday, August 19, 11 am. UNC-TV’s D. G. Martin will feature the anthology on North Carolina Bookwatch. The digital formats will be available at a special pre-order price of $3.99 through the publication date, July 31. After that, the price will be $8.99. Missed one? Read the spring edition here.